I have finally decided to try out a tall cake – it’s really been the trend in the cake world for a while. 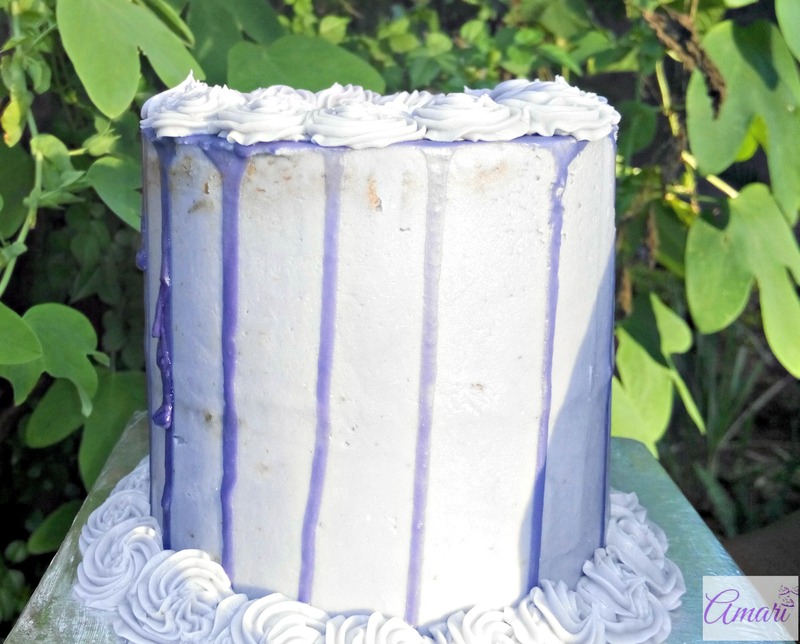 I actually had someone ask me if it’s possible to do a tall cake with colored glaze instead of colored ganache since they were looking for a simpler and more economical recipe. That’s when I decided to try this simple recipe out with purple glaze and I’m rather satisfied with the result. This recipe will be great for anyone who hasn’t tried a tall cake before and is looking to start out simply. 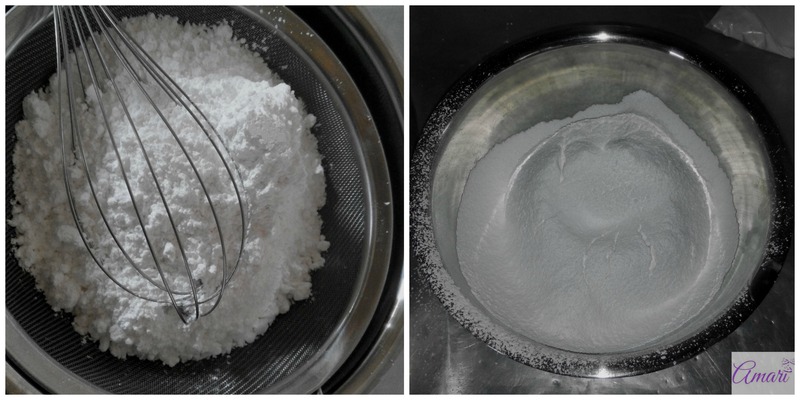 In a medium bowl, measure and sift your icing sugar. In a large bowl; measure your margarine and vanilla essence. Pour half the icing sugar into the large bowl and cream the ingredients with a mixer for about a minute, add half the milk and keep creaming. Add the rest of the sugar and cream the ingredients while adding the milk gradually until you get a creamy consistency. This should take about 5 minutes. Add the color into the buttercream frosting and beat for about a minute until all the color has been incorporated into the frosting. Level your two mini-cakes, making sure they have a flat surface and are the same height. Take one cake and place it on your cake board. Put two spoonfuls of buttercream frosting into your icing bag and create a dam using the star tip (draw a border at the edge of the mini cake). Scoop a spoonful of frosting into the dam and fill it. 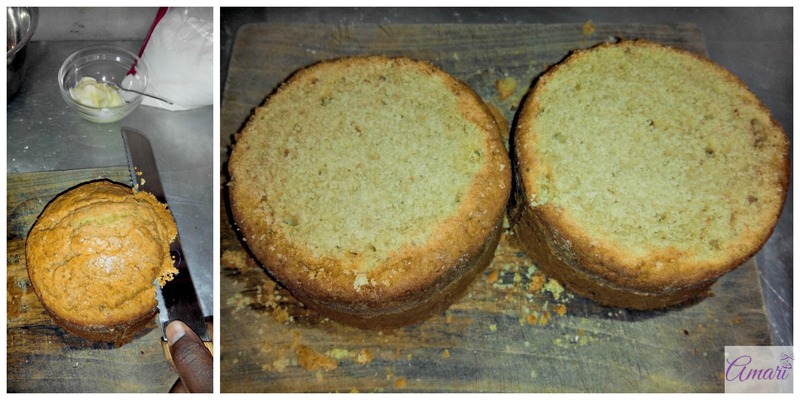 Place the second cake on top of the bottom cake and make sure to align it properly. 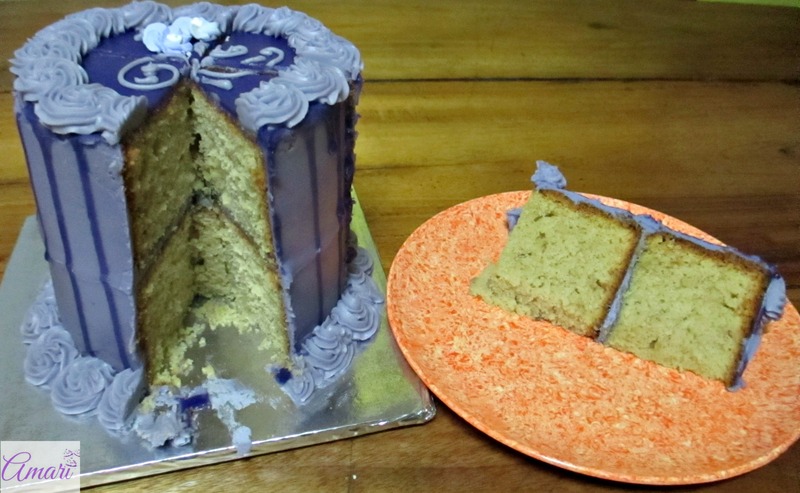 Now, cover your whole cake with a crumb coat (i.e., cover your whole cake with a thin layer of buttercream frosting). Let your crumb coat set for about 20 minutes, then apply another layer of buttercream frosting. (P/S: I would really advice for you to let the crumb coat set – it will avoid the middle bulge you see on the side of the cake: I didn’t let my crumb coat set long ^_^. Let it set, then apply the second coat of frosting and smooth it well). As it’s setting; make your purple glaze (recipe below) and then pour it carefully on the top of your cake. Pour the glaze a spoonful at a time and spread it on the top carefully; then using your spoon, let a little bit of glaze pour onto the sides, creating your nice drips – don’t overdo it and drip too much glaze. Let the glaze set for about 5 to 10 minutes. 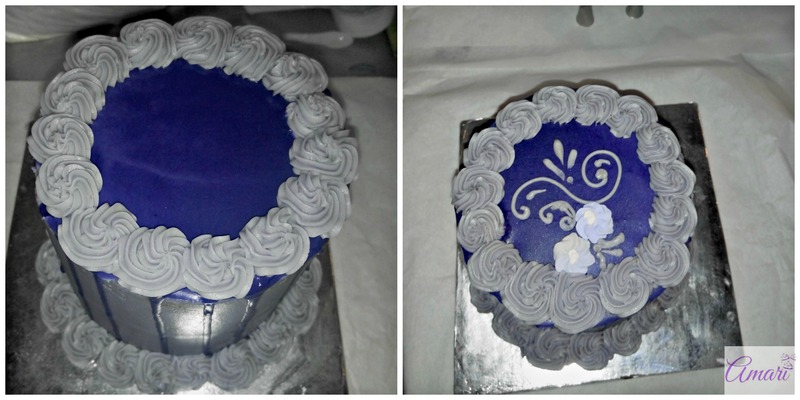 Fill your icing bag, halfway – then using the star tip to make swirls on the top edge of your cake. Do the same for the bottom edge of the cake, all the way round as well. As for the top, you can decorate based on your preference; you can write the message on the top of your cake for example. As for me since it was for personal use, I used the round tip to make the vine decorations and the ruffle tip to do the three drop flower decoration. 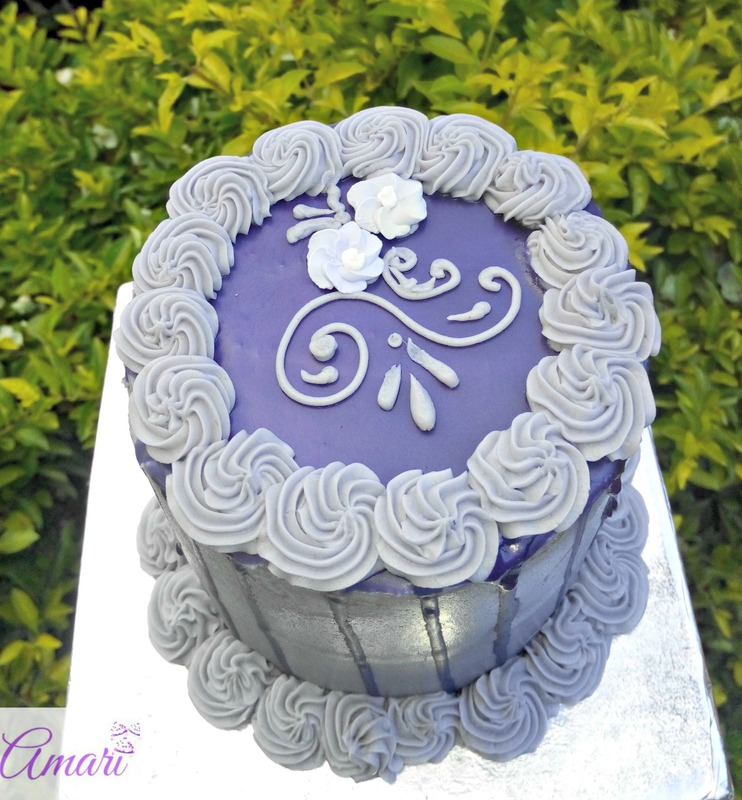 I also used two pre-made royal icing purple daisies that can be purchased from a cake accessories shop such as Topserve Ltd or Walibhai Karim or a major supermarket such as Nakumatt or Tuskys. Please try out this recipe out and let me know what your results are. In a medium bowl, sift the icing sugar. 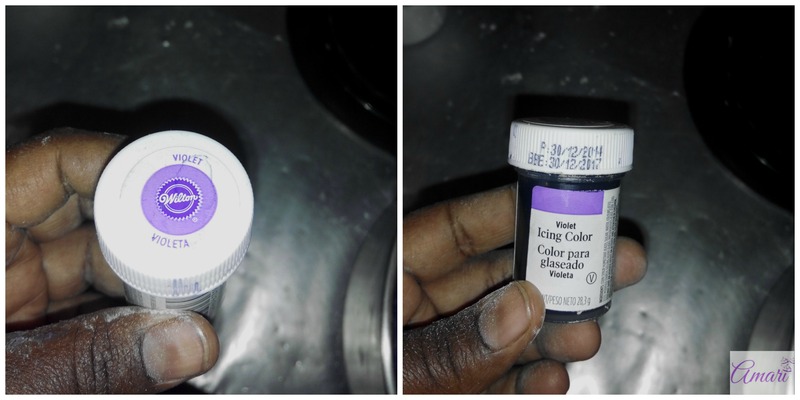 Add the gel color and water gradually and mix with a whisk until color is well incorporated and the glaze has a flooding consistency. You want the glaze not too runny, but not too thick in order to be able to spread it well and have it drip on to the side of the cake. If you would like to learn how to bake cakes such as vanilla, as well as how to make frosting and decorate a cake. Make sure to book our Basic Cake Making and Decoration Short Course – you’ll learn how to bake and frost in three sessions. Click here for more information. The purple glaze looks really good Maureen. Though, what about more layers in the cake. Hi Kenneth, thanks. What do you mean? Would you like to add more layers? If that’s the question, then yes you can. Thanks a lot, I have really learnt a lot from you, even though have knowledge on cakes. Your simplicity in explaining is amazing. My question is how do you make flowers using royal icing kindly explain and may be do a video.